No wet bag riding here! If somebody asked you whether kitesurfing requires lots of strength, you probably would say no. It is not until you start to unhook that strength makes quite a difference. While unhooking alone and popping a railey won’t be very taxing, once you start looking into passing the bar, it all changes. And while there are more and more girls now on the water working their way up the freestyle ladder, it is still rare to see power and style combined as well as Helena Brochocka is demonstrating in her latest video. During her kitesurf trip to Western Australia, she had perfect conditions in Safety Bay where she worked on those core strength moves. Watch how powerful her passes are, how she pulls that bar towards her hip before the pass – no hanging off the bar like a “wet bag” here! You go girl! Helena Brochocka – The Bright Side from Helena Brochocka on Vimeo. https://i2.wp.com/www.alwayswindy.com/blog/wp-content/uploads/2015/02/Helena-Brochocka-The-Bright-Side-on-Vimeo11.png?fit=952%2C532 532 952 Mark http://www.alwayswindy.com/blog/wp-content/uploads/2018/02/logo5ArialORANGE2018-340-156.jpg Mark2015-02-25 08:21:562015-02-25 12:38:08No wet bag riding here! If you have tried using a GoPro to film yourself kiteboarding you probably know how difficult it can be to get decent shots. If you mount it on your board you might get lots of water splashing around your super imposed foot and if you mount it on top of your kite, you seem miles away. The in between solution is a line mount and while giving you good views of the rider, it can end up being a very dizzying affair. But here is an exception that is worth your time – watch Billy Parker pulling some massive megaloops in Cape Town during his preparation for the King of The Air competition. Simply breathtaking. BP CapeTown KiteLoops from Billy Parker on Vimeo. 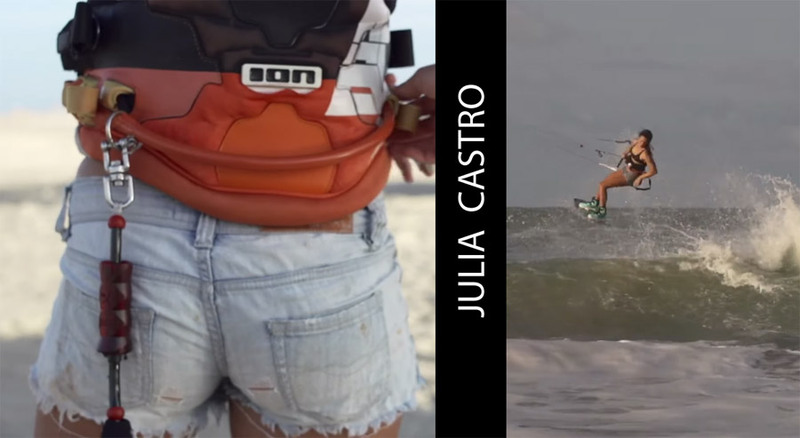 Growing up in Fuerteventura made Julia Castro the kitesurfer she is now. Sponsored by Best Kiteboarding and many more, this girl is hard at work on becoming a top contender at the upcoming PKRA 2015. Watch her training video in Brazil’s most famous lagoon Cauipe near Cumbuco, where we too like to hold our training winter camps. As many of our guests know, we believe in making kitesurfing available to as many people as possible and are willing to go the extra mile. Our free online instructionals are proof of that and have helped many laerning kitesurfers to nail their favourite moves. But there are many more ways that can help to promote the sport and the Swiss rider Manuela Jungo has chosen to pass on her passion to young kids who probably never even saw a kite before she came to their island. Manuela invited a group of school children at the wonderful island of Guanaja, Honduras, to introduce them to the wonderful sport of kiteboarding and teach them the first few steps using trainer kites. GIVE & TAKE from Manuela Jungo on Vimeo. There are only a few kitesurf events that make real headlines and the Red Bull KOTA is right at the top. This year the 5 times world champion Aaron Hadlow managed to take the win by pulling a KGB megaloop. While a KGB is already a hard enough move (think inverted half backroll with an airpass and a 180 degree landing), doing that during a megaloop is just plain nuts. Let me also add that you cannot do a megaloop if it is not seriously windy, say around 30 knots. You can watch the finals summarized nicely in the video below but personally I have to say that the semi finals were even more mind blowing. Especially one megaloop boned tailgrab by Kevin Langeree (see photo above) is the kind of wallpaper I want on my desktop. Watch the semi finals here and check out that megaloop around 3:25. Plain awesome! Is kitesurfing a way of life? Many of us kitesurf because it makes you switch off and think about nothing except the sensation of gliding over the water. This feeling is so addictive that many see kitesurfing as a lifestyle. Greta Menardo has been kiting since she was a small kid and shows us how it has affected her way of life. https://i1.wp.com/www.alwayswindy.com/blog/wp-content/uploads/2015/02/Greta-Menardo-kitesurf-girl-1024x5331.jpg?fit=1024%2C533 533 1024 Mark http://www.alwayswindy.com/blog/wp-content/uploads/2018/02/logo5ArialORANGE2018-340-156.jpg Mark2015-02-16 08:42:502015-02-25 12:45:44Is kitesurfing a way of life? While the name Malin Amle does not sound as familiar as Gisela, Karolina or Bruna, this nordic girl is one to look out for. This edit shows some of here highlights in 2014 and judging by her success in Boracay (first in Freestyle at the PKA competition), I think we will see a lot more from her in the future. Malin Amle – 2014 from Malin Amle on Vimeo. Back in 2010 when we started to promote Gokova, we had to find a way to show the beauty and the shallow, flat water conditions that this wonderful kite spot offers. While we tried showing it from the riders perspective by using a helmet mounted GoPro, it still did not offer enough visual impact and so we started looking into making aerial videos. Initially we though about using a para-glider or an ultra light to fly and shoot the bay but we wanted to show the kiters and that meant flying with wind. As it turned out, there was a way to do this using remote controlled airplanes and early on we started looking into flying FPV (first person view) in order to be able to frame the shots we wanted and fly over large distances, without the need of actually seeing the aircraft from the ground. Since then, this technology has taken off and now whether using airplanes or multicopters, aerial shots are being used everywhere. Nothing seems to capture the sensation of kiting like a video from above. And while this is slowly becoming standard, we are already a step ahead and will be presenting a completely new way of seeing our kitespots, something that feels “virtually” real. Stay tuned! It is no secret that we are sponsored by North Kiteboarding and yet that does not mean we do not fly other kites. One kite we had for testing last year was the Bandit from F-One and it left a very good impression on us. When compared directly to our bread and butter Vegas, this kite had loads more hangtime on pretty much any jump and transition. In fact, for any floaty moves such as jump transitions, darkslides, jesus walks, this kite excels. When unhooked, the kite created a very nice pop that felt very similar the Vegas. We did not have many complaints except for one main issue. While the 3 strut design does result in a lighter kite, it also means more slack and flutter in the canopy when depowered. This however, is something F-One has addressed in their 2015 update as well as improving the durability by using double ripstop Teyjin fabric. Our centre manager and 6 times Turkish freestyle champion Taner Aykurt, is F-One’s distributor and sponsored team rider for Turkey so when you come to Gokova or Ayvalik, you can try the 2015 for yourself. F-ONE Bandit 2015 (En – Fr) from F-ONE KITE on Vimeo.